Print HWT font style handwriting lessons 1 - 24 that are coordinated with the book, Teach Your Child to Read in 100 Easy Lessons. All 100 handwriting lessons are made by Donna Young. 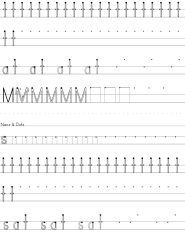 The handwriting letters that are introduced in this group of handwriting lesson worksheets are ... m, s, a, e, t, r, d, i, c, o, n. The uppercase letters that I decided to add are ... S, M, T, R, I. The words that I added to the lessons are ... am, Sam, see, at, sat, seed, mad, rat, ear, it, Rat, is, sad, me, rid, ram, cat, It, is, mom, rod, not. Light orange means that a letter is introduced for the first time. Light green means a word is used in the lesson. Pink indicates the lesson will include an uppercase letter. Lesson 17- s, e, d, Rr, Rat is sad. Lesson 18- m, a, i, me -- The letter i has fewer dots, but there are arrows above where a letter i could be written. Project ongoing - 1st files uploaded on August 12, 2014. For more handwriting practice in this style go to: HWT Handwriting Practice Worksheets. While getting the site-cd updated I noticed the super-nifty "Surrounded by a Calendar" row planners were about to become outdated!!! OH! NO! So I made a whole lot of them for YoungMinds and you'll find a more modest amount online.